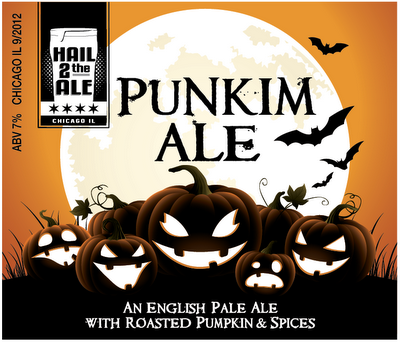 Hail To The Ale: The Return of Punkim Ale! 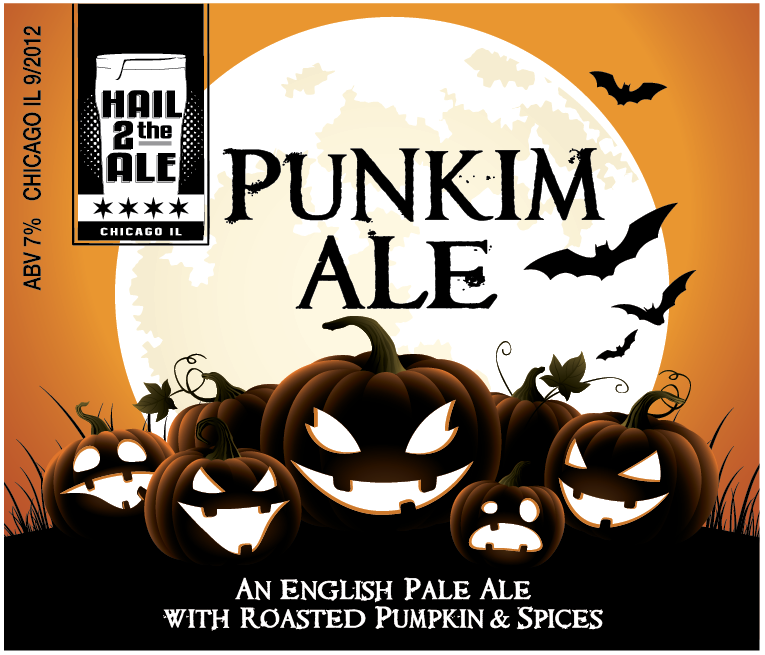 Last fall's Punkim Ale was probably one of my favorite beers I've brewed. I'll admit that I'm always ready for summer to end so that the more robust seasonal beers can start replacing the over abundance of hoppy IPAs. 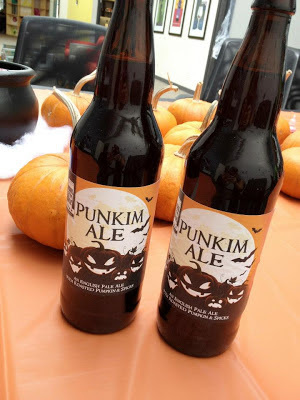 Since I'm always looking to improve on my recipes and techniques I did some additional research and taste testing to see how I could make Punkim Ale 2.0 even better. I felt as though I was able to achieve the right blend of "conservative spicing" but I was craving a bit more malt in the body. I used Zainasheff & Palmer's "Brewing Classic Styles" Pumpkin Ale as a guide, with some slight variations to the specialty malts. This recipe had much more caramel malts and less bittering hops than my last recipe. Their spice combination was spot on, but I added it in three different stages of fermentation rather than solely at the end of the boil as I had in the past. This time around I was enamored with the idea of creating a glow-in-the-dark label. Who drinks beer in the dark you may ask? I have no idea, but it sounded flippin cool. I simplified the label design from last year a bit to open up more white space for the florescent paint to adhere to. I also sprayed the beer caps (prior to bottling) with many light coats of the paint as well. There was however, a flaw to the plan - the fluorescent paint requires significant light exposure to keep the glowing capability "charged"... and as you may know light exposure is not a friend to bottled beer. The initial label did have a nice little glow but as time went on it faded out. Upon talking with a friend I learned that quinine (the bittering agent found in tonic water) naturally glows under black light. I wonder if anyone has tried adding quinine in primary fermentation to attempt making a glow-in-the-dark beer or what affect that would have on the flavor? Punkim Ale 2.0 making its debute at the company Halloween party!